FA: Dave Jones and Glen Rink. This climb begins on southern end of the west face in a recessed left-facing corner/chimney. The easiest landmark to spot on the route is the straight-in hand crack on Pitch 4. The buttress that Hue and Cry ascends is capped by a small and steep red headwall. The final pitches exit around to the right of this headwall. Descent: descend the south ridge. 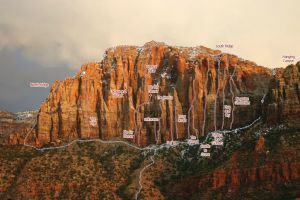 (see North Ridge route description). Rack: 2 ea to 5.5”, 1 extra 2”, nuts, long slings, 2 ropes for descent. Which SuperTopo guidebooks include a topo for Hue and Cry?